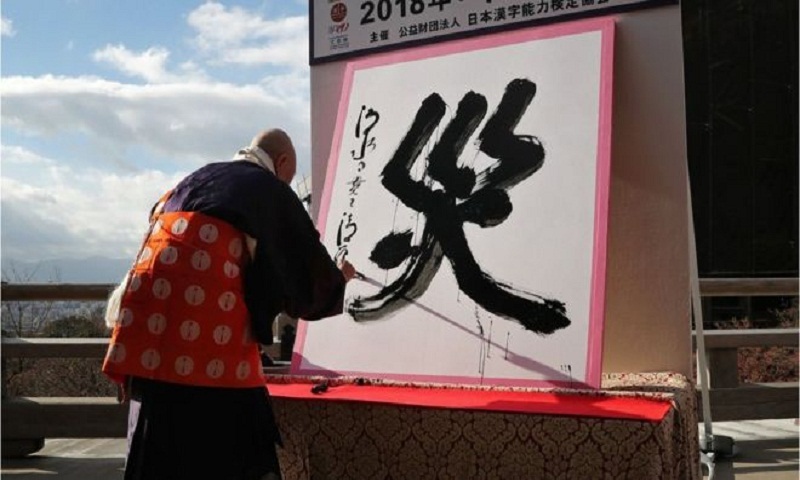 Japan has chosen the symbol meaning "disaster" to define the year 2018. Television stations broadcast the announcement live as the master of an ancient temple in Kyoto wrote the winning term on a white panel. In the annual vote, the public nominated this kanji character after experiencing a number of natural disasters. Japan has suffered flooding, typhoons, earthquakes and heatwaves in 2018, leading the economy to shrink. It fell by 1.2% in the third quarter thanks to the damage caused by the events. Flood waters swept across the country in July, killing nearly 200 people and causing the evacuation of close to nine million across 23 prefectures. The Kyoto-based Kanji Aptitude Testing Foundation has run the competition every year since 1995. This year's symbol - pronounced like the English word "sigh" - was chosen by just fewer than 21,000 people. A kanji symbol for peace came second. "North" won in 2017 after North Korea's missile launches, and "gold" in 2016 after the Rio Olympics. Chinese characters, or kanji, are used widely in Japanese as well as other alphabets.